These sweet and wonderful pin keeps were found together with a note attached that reads “Keep your fingers warm” on one side and “from Julia” on the other. The larger of the two is fashioned out of a tan patterned brushed silk moiré on one side and a plain pink moiré on the other. 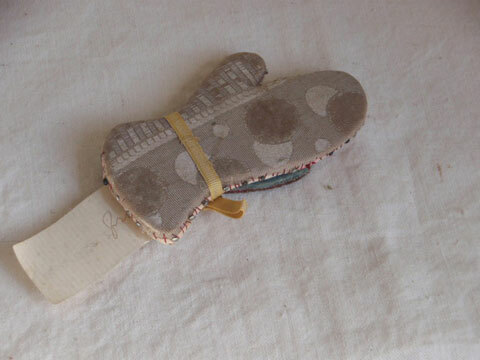 It measures 3 ½ inches long by 2 inches wide. 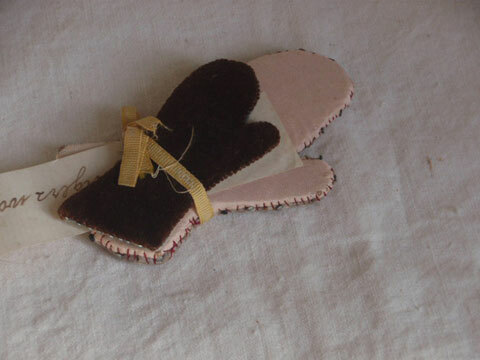 The smaller “mitten” 2 ½ inches long by 1 ¼ inch wide and is fashioned out of brown velvet on one side and blue velvet on the other. 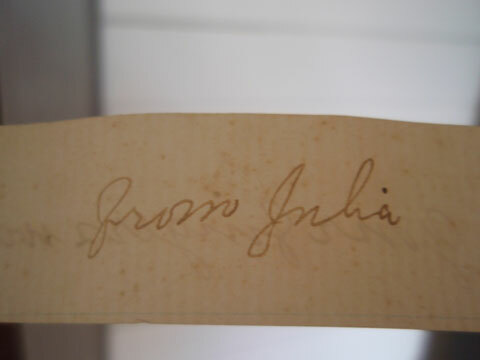 They are in excellent condition and still retain their original mustard ribbon tie. They both are entirely hand sewn.